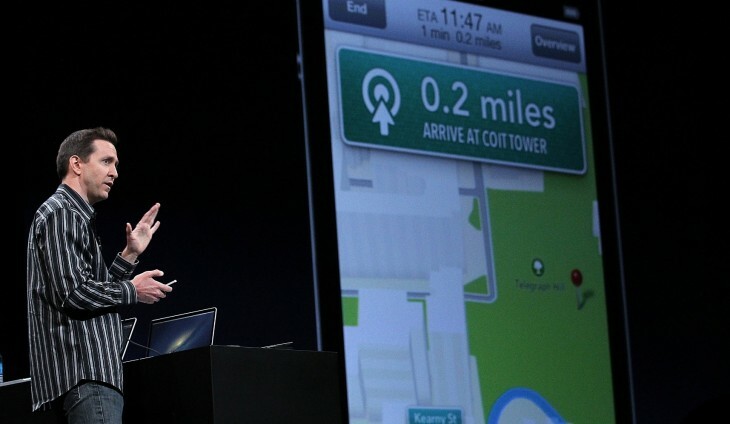 Driving navigation apps slipping into Apple Maps’ transit section, is it oversight or leniency? When Apple launched its new Maps app on iOS 6, one of the most talked-about missing features was built-in transit directions. Being able to request a route from one point to another and have the directions delivered in the form of transit services like trains or busses is one of the primary components of many mapping services, including Google Maps. Apple’s solution for this was to provide a section in the Maps app that appears when transit directions are requested. The apps featured in this section are third-party apps which offer routing via train, bus, bike and other forms of travel that aren’t cars. WORKS WITH APPLE MAPS: When you find a place to visit using the Apple Maps app, TomTom can guide you there. Simply select TomTom as the routing app and enjoy world-class car navigation. (requires iOS6). I was curious, as this seemed to imply that you could send the route from Apple’s Maps to the TomTom app for car navigation, something that Maps already does. That is not what the transit app section was designed for. It’s there to offer transit apps, not turn-by-turn car navigation. If you’re not familiar with the way that apps are targeted to appear in the category, it’s actually rather simple. Developers can specify the regions that their apps are related to using a basic geographic area during their app submission process. When the transit section pops up, you’re presented with the apps you have installed at the top and then ones which have your region specified below. If you have an app installed, you can tap the ‘Route’ button and your start and end-point information will be passed to the app. This means a minimum of re-entering data. The app processes your route and delivers you directions all on that single launch tap. 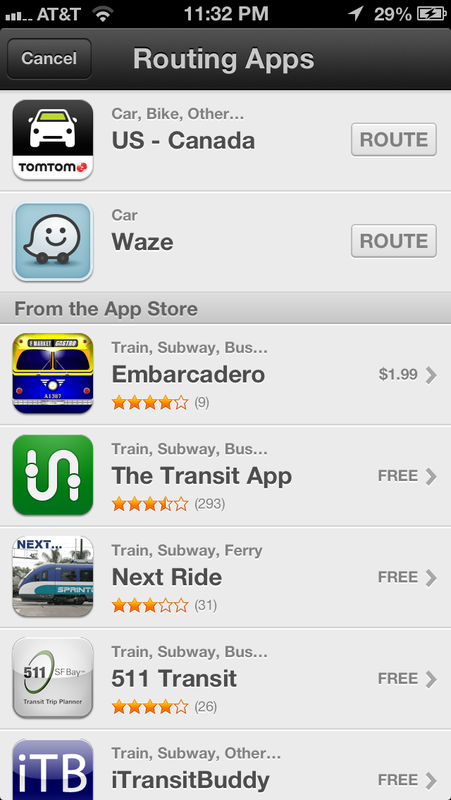 But, as of last night, there were more than just transit apps taking advantage of this special section. Both TomTom and Waze, neither of which seem to perform transit routing (Waze doesn’t claim to, it just says ‘car’, but TomTom does) now appear in the transit section. This is obviously a perversion of the way that it’s supposed to be used. And it’s confusing as you’re tapping on the ‘Transit’ button to get ‘Driving’ directions. That’s not how this should work. If you check out the reviews of the TomTom app you’ll notice reviews from people who have figured it out, but are still confused. Now, there’s always the question of whether or not Apple is aware of the fact that this is occurring but TomTom didn’t exactly hide the feature and it’s not a low profile app. Perhaps Apple is letting this happen because Maps is inferior enough that there are some very viable alternatives on the App Store? It also raises some interesting questions about whether you’ll be able to ask Siri for a location, tap the transit button and choose Google Maps as a navigation provider once that app makes its way to iOS. I’ve made inquiries to TomTom and Apple to see what’s up with this, but I don’t have high hopes for a response. And this remains an extremely curious and intriguing loophole in Apple’s transit app solution.